This month my fellow FAST members and I are participating in a Challenge to create fiber art ACEO's. If you don't know what FAST is, it is the Fiber Arts Street Team on Etsy. An ACEO is an Art Card Editions and Originals, or miniature artists cards that can be for trade (ATC) or sale (ACEO). For those who are fans of ACEO's or those who are new to the concept, please check out our fibery creations and see the diverse talents of FAST. 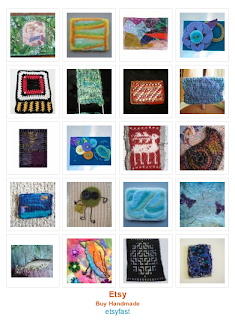 Simply search Etsy for the "EtsyFAST" and "ACEO" to find our fiber art cards. You can also just check out the FAST website for several featured ACEO's.